Home/Headlines/Is there an election on? Well the date may not have been announced yet, but one way or another there’s going to be a Federal Election happening in May. In the run up to the election, the Australia Conservation Foundation has taken some space in Bay Terrace (where Casa di Louie’s restaurant used to be – in fact you can still see the logo in the doors!) 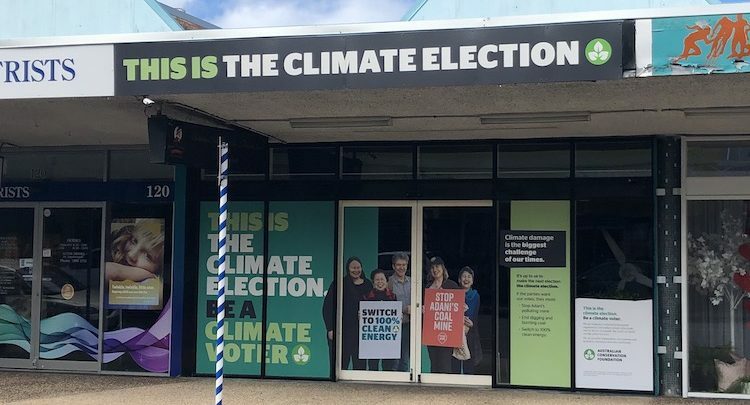 and has used its shopfront graphics to let everyone know that this election will be ‘the climate election’. As reported in the Wynnum Herald this week, the Australian Conservation Foundation is organising a public forum on climate change at 6.30pm-8pm on Wednesday 10th April at Wynnum Municipal Hall in Bay Terrace (219 Bay Terrace). All prospective candidates in the election for the seat of Bonner have been invited, however the current member, Ross Vasta MP, has indicated that he will not be able to attend. Candidates who have indicated they are able to attend include ALP candidate Jo Briskey and Greens candidate Barbara Bell. Let’s not forget that there is also a Federal Budget coming up this Tuesday 2nd April (and our guess is that the date of the election will be announced within 24 hours of the budget). 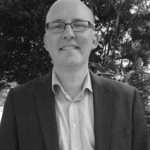 If you are interested in not only the implications of the budget but also of the tax policies of the major parties in the run up to the election, you should go along to the Budget Morning Tea being held in Wynnum this Wednesday morning, where Grant McCarthy from McCarthy & Co accountants (pictured) will be talking about the impact of the budget on business and explaining the main tax policy differences between the Government and the Opposition. You can book into the meeting here: https://wynnumbusiness.org/events/.